This essay originally appeared in a catalogue titled “Treasures from the French Embassy Collection” produced by the Melbourne Cinémathèque in 1998 and has been re-published here with the kind permission of the author. Seeing Pickpocket again after a long absence, one is forcibly reminded that it was being shot on the streets of Paris at the same time Godard was shooting A Bout De Souffle (Breathless, 1959) (1), and that Bresson’s film is an often overlooked watershed film of the New Wave. In the first instance, this shows in the film’s triangulation between old European culture, via its borrowing of Dostoevsky’s Crime and Punishment situation; new French culture, with its topical reverberation of Albert Camus existentialism, and the gratuitous act; and Hollywood culture through its invocation of Frank Borzage’s films of spiritual transcendence; but even more strategically specific to New Wave practice, the film twists each of these three loose from its context and re-places it in a new way (2). Pickpocket was coolly received upon release as a difficult film (not an insinuating charmer like A Bout De Souffle (3)), but it found champions along the way, including Paul Schrader (4), who saw the film as part of his favourite genre: two-character films, where one character is the man and the other is his room (and indeed, Pickpocket is one of Bresson’s films about imprisoned persons, metaphorically and finally literally). While the film’s crystal austerity moves toward minimalism, Bresson insists on the subjective, limiting viewers strictly to that which the loner hero, Michel (Martin Lassalle), sees, says, thinks, writes; this is reinforced by his voice-over narration and his on screen writing, and emphasised by a near-total absence of leading music. But Michel reveals little, feels little: he has largely withdrawn from individual engagement with people in his world – his dying mother; the friend and potential lover Jeanne, who nurses her; his male friend Jacques, to whom Michel ‘gives’ Jeanne. His one passion is the art and crime of picking pockets; here he finds fear, excitement, exultation, guilt a life of feeling. He studies with a master and works with a Pickpocket gang, using his expertise, sometimes barely escaping capture. It is in this underworld that he finds his interlocutor/therapist, a police detective intent on apprehending him. They have a series of Raskolnikov exchanges about superior human beings being above the law; these exchanges are not true dialogues, however, but Michel’s deadpan trying-on of postures. Lives and events in Pickpocket are not explained or motivated; the film’s genius is in cutting such material away, leaving only direct presentation. The exhilarating virtuoso sequences of pickpocketing on the metro, in stations, and at the races are good examples of this: the actions themselves, as done and framed and cut, without comment, explanation, or dialogue, are sufficient for us to understand Michel’s experience (5). Here, Schrader’s favourite second character (the hero’s room, the material world) arises: if, as Ken Kelman writes (6), Bresson’s use of acting style and his refusal to supply psychological motivation thwarts our usual expectations of character explanation; and correspondingly, if his systematic use of ellipsis (separating events and sequences from one another rather than causally linking them) cuts off our dependence on the dominance of narrative, then the film has a large new latitude in which to operate – not the least effect of this is to concentrate our attention on the details of filmmaking. No longer practicing either to please or to explain, the film can now ask the viewer to take a meditative stance, to undertake an act of witnessing within frustrating limits, and so to have the time and opportunity to go back to/to begin with what is given by the film – the material world and what may be made to arise from it. Many viewers involve themselves in larger and more abstract issues (which the film certainly makes available), but the poetry and the wonder of this film begin here. Faces – most notably that of Michel – are at the extreme of impassivity, their materiality one of non-intervention, their sensuality undeniable and unchanging, frozen amid a quiet frenzy of signals and actions. Hands, most particularly, have an independent life and art; everything done with hands is part of or related to the central (and quite sexualized) metaphor of the film, picking pockets, and each gesture needs to be remembered by us for comparison and recognition at a later stage of the film. As if it were not enough to be a virtuoso of hands, throughout the film Michel sends tantalising signals with doors how he opens them, how he closes them, how he finds them and how he leaves them – because the film is about Michel’s movement being arrested finally, a closing stillness enforced by the prison cell door he cannot physically open, a material condition of the transformation he undergoes in this concluding scene. Michel manages to transcend these iron bars as the film brings its material vs spiritual issues to a conclusion. In one reading, Michel has avoided emotional contact with those around him, substituting instead a very pure mania for the precise, beautiful skills of picking pockets and the cat-and-mouse game of avoiding capture; in another view, he has pursued a monastic, disciplined, driven, and in some ways otherworldly life as one of Bresson’s saint-like characters, and a good deal of commentary on Pickpocket is religious interpretation concerned with Michel’s capture as a necessary precondition of his repentance and achieving grace. Another tradition wraps up Michel’s inadequacies and identity problems, his thieving from his mother and her death, the provision of a father figure in the policeman, and the surrogate nuclear family Michel assembles near the end of the film, into a Freudian sexuality reading complete with homosexual digressions via his Pickpocket mentor. Certainly the film provides us with a love story, or rather a coming-to love story, as Michel exchanges obsession and deferral – his Pickpocket world – for a newfound ability to love Jeanne; and while this love story is not told through l’amourfou or I’acte gratuit, neither are its reasons made available to us through the material world of the film. Daniel Millar: “Pickpocket” in The Films of Robert Bresson, Ian Cameron (ed), Studio Vista, London, 1969. For instance, both Dostoevsky and Bresson center their works on crime in order to raise questions about repentance and grace; but where Dostoevsky’s crime (the spontaneous axe-murder of an old woman) is brutal, clumsy, and one-off, Bresson’s is the opposite: contemplated, studied, prepared for, cool, requiring great skill and dexterity, and ongoing. Richard Roud: “Robert Bresson” in Cinema: A Critical Dictionary Vol. 1, Richard Roud (ed), Viking, New York, 1980. For Schrader, Pickpocket is a key inspiration for Taxi Driver (1976) and American Gigolo (1980). See his reverential first review of the film, ‘Pickpocket I & 11′ in Schrader on Schrader & Other Writings, Kevin Jackson (ed), Faber and Faber, London, 1990, and his more elegant presentation in Transcendental Style in Film: Ozu, Bresson, Dreyer, University of Califomia, Berkeley, 1972. It is hard to imagine that Bresson had not seen Samuel Fuller’s Pickup On South Street (1953) and based his Pickpocket sequences upon it – particularly Fuller’s opening subway sequence – but Fuller’s film did not have a French release until 1961. On the other hand, Pickup was screened at the 1954 Venice Film Festival, at which it won a grand prize. 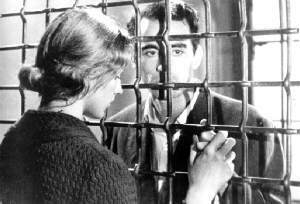 There are many interesting points of comparison between the two films, including: the death of a mother-figure; the hero’s problem making a commitment to the potential lover; a series of philosophical dialogues between the Pickpocket hero and his police antagonist; the interlinking of pocketpicking and sexuality; and the construction of the pickpocket hero as an extreme and deliberate outsider. Ken Kelman: ‘The Structure of Fate” in The Essential Cinema: Essays on Films in the Collection of Anthology Film Archives, P. Adams Sitney (ed) Anthology Film Archives, New York, 1975.